Successfully Added Genova Plus Quadband Dual SIM WiFi Cell Phone with Keyboard to your Shopping Cart. Nothing says powerhouse like the Genova Plus Mobile Phone. With its beautiful 3.25 inch touchscreen, handy sliding QWERTY keyboard, and endless list of amazing features (including quad band worldwide GSM compatibility, dual SIM card slots, and WiFi) this brilliant smartphone has something for everyone. It even comes with a free 2GB TF microSD card! Sliding QWERTY Keypad: No more having to bother with alpha-numeric keys and having predictive text mess up your message – send messages, type emails, and navigate more easily and quickly with this full sliding QWERTY keypad. Just bring it down when you need it and send it back up when you want to use the Genova Plus's 3.25 inch touchscreen instead! WiFi web browsing: With WiFi on the Genova Plus Mobile Phone, high speed internet doesn't cost a thing. Just scan for any available connections and you can start surfing the web in mere seconds - for free! Email on the go: Just spend a minute setting up your POP3 or IMAP4 account and you can check your Gmail, Hotmail, Yahoo! Mail, and whatevermail account in seconds! Java: Built-in Java technology means you can get the latest Apps to use on this phone. 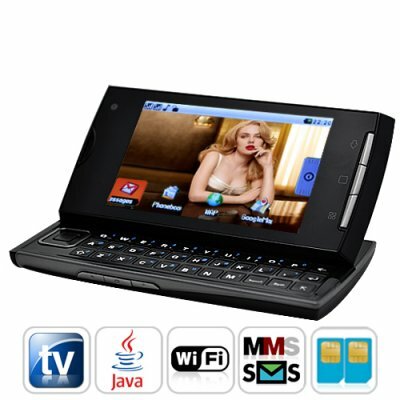 Whether for business or pleasure, this phone provides a great platform for any Java-based application you want to run. For example, Facebook, Google Maps, eBuddy, and Yahoo which are all pre-installed onto the Genova Plus Mobile Phone! So much more: Analog TV, FM radio, Dual Cameras, MP4 player... the list is endless! Just get it and try the powerful, full-featured Genova Plus smartphone for yourself! A truly superior cellphone for every aspect of your life, the Genova Plus Mobile Phone has it all. With a stunning 3.25 inch touchscreen, full sliding QWERTY keyboard, and full list of features, you are seeing convenience and power and its best. Brought to you by the leader in factory direct China electronics and mobile phones - Chinavasion. - Options: My Channel, Jump to Channel, Auto Search, Area Select.